After years in the construction industry, Shay Sekler had a better idea when it came to constructing interior walls for office buildings and other structures: demountable partition walls, or sturdy yet light weight walls that could be customized and reconfigured from one location to the next. In 2001, the two began formulating their idea, working on prototypes, and publically launched their flagship product — the IMT Wall — at the IIDEX 2002 in Toronto, where their new company, IMT Modular Partitions Ltd., was rewarded with the prestigious Gold Award in the systems furniture category. Since that time, the company has installed more than 100,000 linear feet of modular demountable partition walls in the North American market, particularly the Greater Toronto Area, as well as international locations and the eastern United States. Our diverse customer base includes the likes of Novartis (pharmaceuticals), The University of Windsor, multiple locations for the federal government of Canada, Microsoft Corporation (computer software)-Calgary and Winnipeg, Google-Israel (search engine services, among others), Adecco (employment services)-Toronto, and many others. 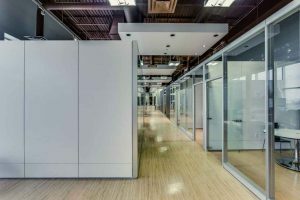 Similar in design to traditional drywall, the company’s demountable partition walls offer a greater range of benefits not only because they can be moved and reconfigured within the same office space, but because they offer greater flexibility in terms of layout and features than regular drywall. For instance, while most drywall comes in 4 foot widths, the IMT Wall comes in standard sizes from 12 to 48 inches wide in 12 inch increments, or custom dimensions as required. The standard height is 8 or 12 feet, but other heights can be accommodated through special design and ordering arrangements. Whether you are a business owner or facilities manager, you are aware of some of the drawbacks of working with traditional drywall. It creates significant dust and debris when cut or installed, is difficult to transport, and normally cannot be removed and re-purposed to accommodate different office layouts or designs. Our demountable partition walls have no such limitations and, in fact, present an attractive alternative to drywall and other wall materials when considering the environmental impact. All IMT demountable office partition walls can be removed and remounted, normally with a 98 to 100 percent success rate. Installation or remounting results in limited airborne dust. IMT walls take up less landfill space than drywall, in the event that they are not reused. IMT walls meet LEED certification for commercial interiors, assuring a high performance and healthy work environment and one that costs less to maintain. 94 percent of the raw materials used to manufacture our demountable partition walls come from recycled sources. Steel components include a minimum of 8 percent recycled post-consumer materials, and 33 percent post-industrial recycled content. The aluminum content features an even greater percentage of recycled source materials, 13 percent consumer, and 48 percent industrial. Wood claddings are made from 3 percent post-consumer recyclables, and 33 percent post-industrial recycled.